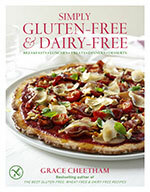 Flick through this section and you’ll discover mouth-watering recipes created specifically for allergy-free diets. Dive in and find a selection of recipes without the common allergens for your breakfasts, lunches, teas or snacks, dinners and desserts. I’ve put a few of my favourite recipes from my cookbook in here and new ones, too. Some of the recipes use ingredients which replace the common allergens, while the others are naturally free of these. On each recipe page you’ll be able to select whether you’d like to read the UK, US or Australian version, and you’ll be able to see clearly if it contains any of the common allergens, in other words, any gluten, wheat, dairy, nuts, yeast, eggs or citrus. You can print these recipes, send to a friend or store in your recipe folder. And you can also look at related recipes and related ingredients (just click on the underlined word(s). If you’ve been following a bland, restricted diet, it’s time to branch out and experiment with amazing ingredients and simple, easy-to-follow recipes. Forget the boring, unappetizing allergy-free meals, and dive into the delicious recipes featured here. And enjoy! Here you’ll find delicious, nutritious recipes to start your day with a energy boost. Forget the bland rice cakes and limp lettuce leaves, and discover wonderfully delicious – yet nutritious – lunches. 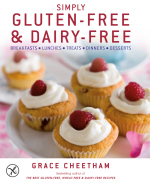 Dive into cakes, cookies, biscuits and breads and all without gluten, wheat, yeast or dairy! A delicious selection of recipes you can whip up quickly and easily after a hectic day, as well as ones for special occasions. Here are mouth-watering, show-stopping, all-time favourites – all made without dairy. Kick back and indulge!